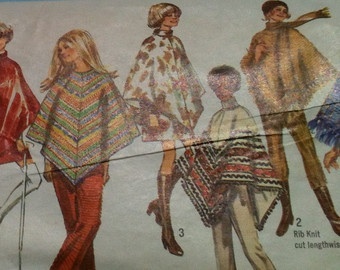 Which poncho are you going to make? If I were going to knit a poncho I would opt for some bulky yarn that knits up quickly and is cosy. I agree, none of those are really ponchos. They’re either wraps or capes and the last one is definitely a sweater!! I’m sure I had a handknit poncho when I was a kid–reading your post gave me some flashbacks. I may have had a matching tam too. I wish there had been an extant picture of my old poncho. I made my mom go through her old photos, but no luck. I really wish that Pickles pattern *was* a poncho! because I love that patterning, but those sleeves give me the willies. I think what’s holding me back on most of these is that I don’t have sufficient yardage in my stash, so I’d have to spin up basically a blankets’ worth of yarn to make one. Maybe I’ll opt for a cape.